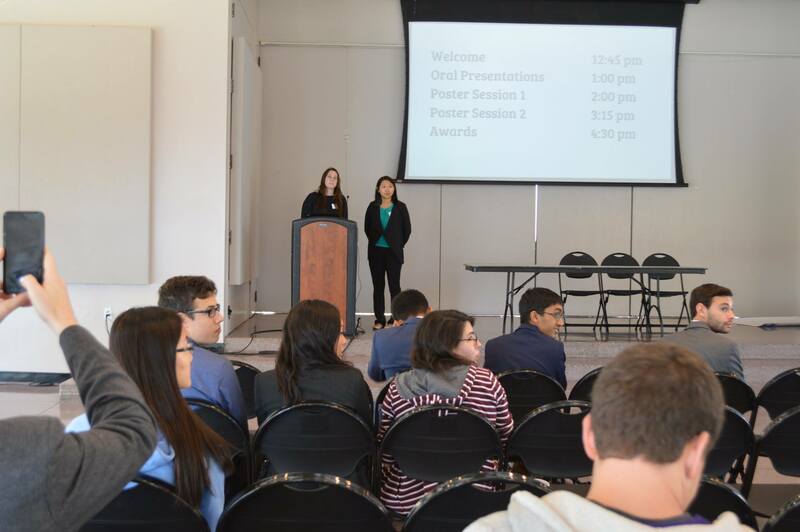 Undergraduate students affiliated with Johns Hopkins Institute for NanoBioTechnology (INBT) laboratories hosted their annual research symposium on Nov 10 at the Homewood campus. 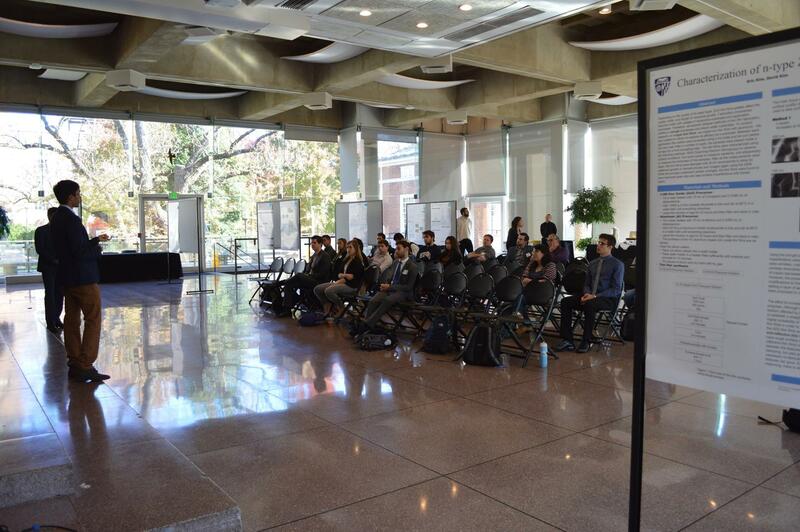 Five students gave oral presentations and 30 students presented posters during the half-day event designed to showcase multidisciplinary work from across INBT affiliated laboratories. 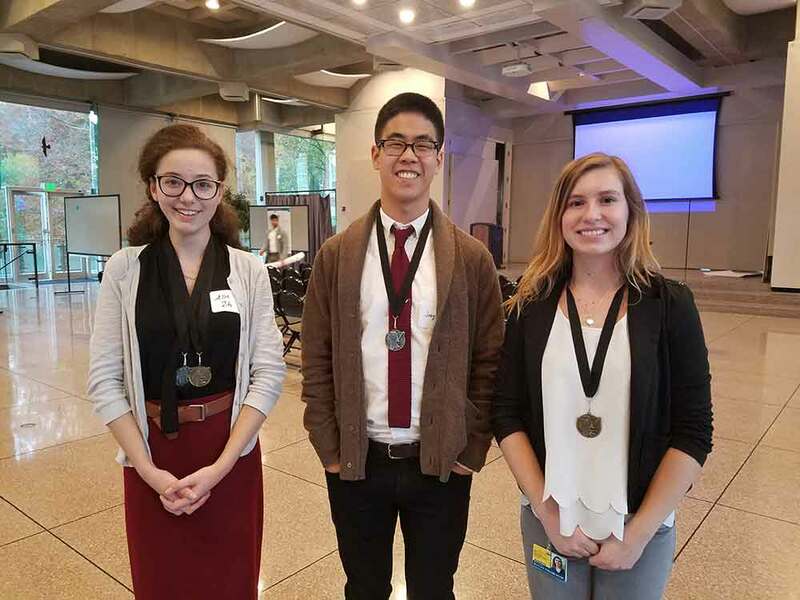 Symposium winners Allie Zito, Joey Li and Hayley Strasburger. Talks were given during the first part of the symposium. Oral presenters included Damian Cross and Aseem Jain, who shared a talk about Perileve: A novel method for refractory ascites; James Shamul, who spoke about a Novel Micellar Drug Delivery System using Poly (Beta-amino ester)-Poly (ethylene glycol) copolymer; Michael Pozin, who presented Heat Transfer Modeling for Femoroplasty Procedure; and Hayley Strasburger, who described how Noggin inhibits bmp signaling in oligodendrocytes progenitor cells to repress trans-differentiation into astrocytes. During the second half of the symposium, poster presenters talked to volunteer judges comprised of INBT staff and alumni. There were three poster categories: concept, overall and crowd favorite. While the volunteer judges evaluated the first two groups, crowd favorite was voted on by every attendee by texting a poster number to a certain phone number. Winners included in the Concept category Victor Tang (1st) and Allie Zito (2nd). In the overall category, Hayley Strasburger (1st) and Joey Li (2nd) were the inners. Allie Zito also won crowd favorite. The event was funded by the Office of the Provost and given organizational support by INBT. Thanks and acknowledgement to everyone who came out to the symposium, to the judges who took time away from their work to provide feedback, the Office of the Provost for funding the event and to INBT, especially Camille Mathis, Ellie Boettinger-Heasley, Tom Fekete, and Gregg Nass.